Vitamin C benefits your skin in so many ways! Get all the facts here! We all know that Vitamin C is important for our skin. There are 100’s of articles, videos and blog posts online advocating the use of Vitamin C. Vitamin C is a potent antioxidant and it is used in skin care primarily to protect against photo-aging and to promote collagen growth. We’ve all heard the buzzwords like ‘Antioxidant’ or ‘Free Radical’ but what do these things mean & why are they important for your skin? Oxidization is the process that turns a cut apple brown, or causes steel to rust. We know that by applying an antioxidant (like squeezing lemon juice over the cut apple) the reaction can be stopped. Oxidization is a chain reaction that continues indefinitely unless the process is halted by the introduction of an antioxidant. The oxidative process in your skin begins when a stable bond between two molecules is stressed by an aggressor (like UV radiation) which causes these molecules to split. 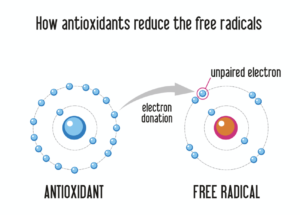 Each of these newly separated molecules (free radicals) now seek to split apart other healthy bonds, releasing more free radicals thereby causing a chain reaction. 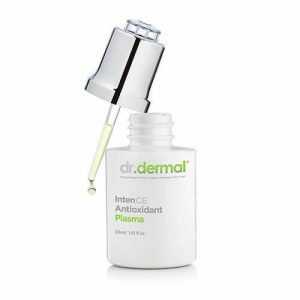 An antioxidant ‘scavenges’, or bonds with a free radical and halts the oxidative process. The oxidation process in skin can be triggered by dust, pollution, smoke or most commonly UV rays. The largest contributor to the development of photo aging & skin cancer development is UV damage. The direct damage that UV Rays cause include direct oxidation of DNA & the generation of free radicals. Your skins only natural defense against UV damage is melanin. Consequently, it becomes immediately clear why lighter skin types (that don’t have melanin) require additional protection against UV assault. We can and should use SPF daily to protect against UV damage, but here’s some information you probably were unaware of – most broad spectrum SPF’s have UV blockers (physical protection) and UV absorbents (chemical protection). These UV absorbents release free radicals as part of their reactive processes. So the unintentional byproduct of most SPF products is the release of free-radicals. It is essential to protect against oxidative damage and potentially skin cancer by including antioxidants as part of your skin care. When Vitamin C (LAA) is combined with SPF, it improves the skins ability to defend against sun damage & slows down the rate of damage from UV assault. It also absorbs the free radicals caused by the chemical UV absorbents contained in broad spectrum SPF preparations. It’s important to note that the Vitamin C (LAA) must be applied BEFORE sun exposure in order to gain the maximum benefit. 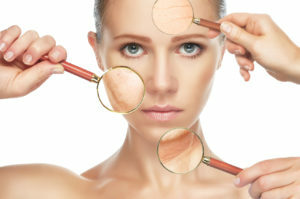 Your skin’s wound healing response is to create scar tissue which is predominantly new collagen. Vitamin C (LAA) is required at every stage of the wound healing process: inflammatory, proliferative and maturative. In the inflammatory phase, Vitamin C (LAA) is required for regulation of the white blood cell life cycle & clearance. During the proliferative phase in which collagen is produced, Vitamin C (LAA) is required for creation & maturation of collagen. During these phases, normal levels of Vitamin C (LAA) in the skin drop and additional supplementation is advantageous as the body seeks to maintain availability of Vitamin C (LAA) for collagen synthesis. During the wound healing process, darker skin types may also be prone to PIH (post inflammatory hyperpigmentation) and Vitamin C (LAA) is essential for these skin types as it is a melanin inhibitor that helps to prevent the deposition of pigmentation. The production of melanin (pigmentation) is initiated by an enzyme called tyrosinase. Vitamin C (LAA) is a tyrosinase inhibitor and decreases melanin formation. It also breaks up pigmentation situated around the hair follicle. It has shown great results in reducing the appearance of superficial pigmentation & age spots. Oral supplementation with Vitamin C does transport Vitamin C to the skin, but in insufficient quantities to combat oxidative stress. The levels of Vitamin C (LAA) in the dermis are much lower than the levels in the epidermis. By applying topical Vitamin C (LAA), the levels in the epidermis and dermis are both increased to effectively combat free radicals. In order to maintain adequate protection from UV rays an unwavering reservoir of Vitamin C (LAA) can be achieved by regular application (8 hourly). Once the Vitamin C (LAA) has reached its peak concentration in the skin, it’s concentration (if not supplemented topically) will halve every 4 days. L Ascorbic Acid is the undisputed King of Vitamin C and is the most important form to look for in a high performance skin care product if you require effective antioxidant protection. The ideal concentration of Vitamin C (LAA) should be 20% since the effectiveness of it as an antioxidant is proportionate to the concentration, but only up to 20%. At higher concentrations the benefits are similar but the side effects and irritation are more pronounced. L Ascorbic Acid is water soluble so it is best presented in a water based solution like a serum. L Ascorbic Acid is effective and stable in an acidic environment of between pH2.5 – 3.5. The pH also provides the effects of a mild peel at this acidity delivering a smoothing effect to the skin. At this pH, the ionic charge is removed from the L Ascorbic molecule and it is transported efficiently through the stratum corneum. The acidic pH also determines the consistency and delivery of the product (serum vs cream for example) since once lipids and thickeners are added to an aqueous solution to make a cream for example, the pH is usually affected and the L Ascorbic Acid will become ineffective. An L Ascorbic serum with 1% Vitamin E and 0.5% Ferulic Acid increases the effectiveness of the Vitamin C by up to 8 fold. The above combination of Vitamin C, Ferulic Acid and Vitamin E may be used in the future for the prevention of skin cancer. When the L Ascorbic Acid is in a micronized form (nano-particles) it penetrates the skin more efficiently. National Centre for Biotechnology Information, US National Library of Medicine; “The Roles of Vitamin C in Skin Health”, Nutrients. 2017 Aug; 9(8): 866. National Centre for Biotechnology Information, US National Library of Medicine; Indian Dermatology Online Journal. 2013 Apr-Jun; 4(2): 143–146. National Centre for Biotechnology Information, US National Library of Medicine; “Vitamin C: a Wound Healing Perspective” Br J Community Nurs. 2013 Dec;Suppl:S6, S8-11.